Dr. Chris and Janet Christensen of Oregon owned & titled Flint. with them ever since." Detailing her continued participation with spaniels, Karen remarks, "I currently have five ranging from 5 months to 13 years old. I'm now most active in AKC hunt tests, and have run one of my dogs in field trials. At a recent spring trial, we just had our first callback to the third series and finished the trial… which was a thrill." Fellow spaniel owners have taken note of Karen's skill at capturing the spirit of these lively dogs. 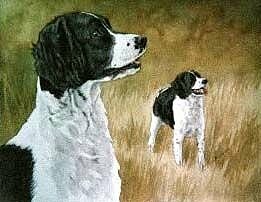 "She has done a number of pen and ink sketches for me," Janet Christensen who is one of the pioneering women trainers and English Springer Spaniel field trial handlers, comments, "and I had her do the oil paintings of both Flint and Scud for the Hall of Fame. She is now working on the one for Misty Muffet. I think she is able to capture the essential quality of the particular dog." Janet adds, "Our club has been giving her pen and ink sketches as first prize in the open and amateur for a number of years." April belonged to Jerry & Cheryl Sligar of Nevada. 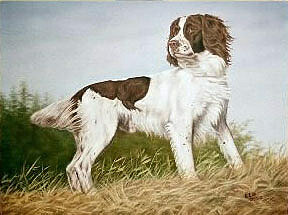 "One thing I'm quite proud of is doing two portraits of English Springers inducted to the Field Trial Hall of Fame which are displayed at the Bird Dog Museum in Grand Junction, Tennessee." Karen speaks of her enthusiasm about past and present projects, "I'm starting work on two more ESS portraits for the Hall of Fame. I feel very honored that the owners have commissioned me to do their dogs for this!" In addition to creating portraits for the Bird Dog Museum inductees, Karen's work has been featured in fundraisers. One was for the Field Spaniel Society of America's 2001 National Specialty and another went to the Puget Sound ESSA's hosting of the 2002 ESSFTA National Specialty in Olympia, Washington. The variety of style and techniques Karen employs enables her art to span the spectrum from playful to dramatic. When asked about the various mediums she works in, Karen responds, "Currently I do portraits in pen-and-ink, pen-and-wash - which is pen-and-ink with watercolor - and oil painting. Sometimes I'll do a pencil, charcoal or watercolor sketch for a change of pace. I've also done some etchings, which I want to continue working on."